Fear. Most of us encounter situations that will lead to that type of instinctive human response. It’s the instinctive response of the disciples who are caught up in a violent storm whilst crossing the Sea of Galilee in a frail sailing vessel, and can resonate with us in the winds and waves that we sometimes face in our own seemingly fragile lives. None of us are immune. Whether its a fear of the future because of all the changes that have happened or are happening in our lives; losing our health, and being dependent on others to take care of us; fear of being unable to support ourselves financially; or fear of losing a loved one, and the loneliness that that would entail for us - we know what fear feels like. So how might we understand better the way in which God is active in the fragility of our lives? Mark describes for us how in this story Jesus conveys three important things which we might take hold of in the midst of difficulty and distress. Firstly recognisingthat God is present with us; secondly discovering that we can trust him with our lives; and thirdly that he wants to transform us from the state of paralysis which fear can cause in us. Recognition - trust - transformation. Firstly then we are encouraged to recognise that God is, if you like, in the boat with us. To begin with though we need to understand the context in which Mark is writing. Mark writes to a community which is in the midst of persecution, leading lives which were at risk and governed by fear. It’s a desperate community where fear is all encompassing and pervasive. So this story set on the Sea of Galilee would have urged that community, and also us, to recognise that God is with us in the midst of the storm. That he is with us. Not remote and uninvolved. We might think that it was patently obvious that God was with those disciples. Jesus was after all in the boat. But listen to what those disciples say. ‘Teacher, do you not care that we are perishing.’ Teacher, they call Jesus - not Lord. They do not recognise who he is. But then Jesus rebukes the wind and gives a command to the sea: ‘Peace. Be still!’ And the storm is calmed. Its a repeat of a the episode in Capernaum where Jesus rebukes and commands a demon to be silent. On that occasion also the disciples ask who this Jesus is, that he commands even unclean spirits and silences them. And as the phenomenon of silence is again delivered at his command on the sea of Galilee, Mark moves the disciples toward the recognition that this Jesus is no ordinary teacher. He is no other than the incarnate God of their ancestors. The same God described in todays Psalm - 107 - as the one who: ‘commanded ...... the stormy wind’ . But there is something else. We often wonder where God is in the stormy wind. The disciples desperatelywondered that whilst their boat filled with water. And Job in the old testament spends 37 chapters giving voice to the question - Where are you? The disciples - Job - we all plead, for God's presence with us. A sense that God is near, concerned, interested, and cares for us. We might not always readily recognise his presence just like those disciples. We want him just to do something. But Mark encourages us further that the deep calm sleep which Jesus initially displays is not inactivity or detachment on his part. Instead its a picture of that which he offers to us in contrast to the destruction of the storm. Sometimes we just need to be still and know that he is God. The second thing that Mark urges us to do in this story is to consider the question of trust. I was at the Abbey with others last thursday evening to hear the Archbishop of Canterbury speak. One of the stories he told was of the former Archbishop of Saigon who was arrested and imprisoned in Vietnam for 13 years. In solitary confinement for most of that period, subject to torture and having to listen to others undergoing the same, he was challenged to consider whether he could trust God when God was all that he had left. How do we respond in difficult circumstances?Can we trust him? When Job complains about his own suffering, God answers him by taking him on a whirlwind tour of wonder at the power behind creation. And God points to himself as the one who is both intimately involved in all that he has created and who remains in control of it. To Job God says - I am in control - trust me. Similarly, Jesus asks the disciples in the boat, ‘Why are you afraid? Have you still no faith’, before they too are awestruck at his command over creation by calming the storm. In the difficult moments of our lives can we still have faith? When we are losing something, can we hold onto a basic trust in God, no matter what the circumstances? Because that is the challenge - to entrust ourselves and our very lives into the care of this God - especially when we’re afraid. And how might we trust? Its a difficult thing. But it will involve us letting go of whatever it is we’re afraid to lose—whether it is our health, our financial security, our relationships, even our very life. Because the essence of fear is an insistence that we are in control. The disciples battled with the boat in the storm rather than trusting Jesus whilst he remained asleep. They couldn’t bring themselves to trust in Jesus, who was with them, until they were so desperate that they shouted at him in frustration. Sound familiar? The real essence of faith is letting go. And its in the letting go that we find peace, contentment, even joy taking the place of fear—regardless of our circumstances. We can’t pretend that’s easy, because it’s not. Mark though urges us to look beneath our fear and see the sustaining hand of the God of grace and mercy, even when life’s twists and turns daunt us. Thirdly, Mark presents a Jesus who calls us out of fear. Fear is no way to live. God desires for us to flourish, to be whole, and we cannot do that by living in our fear. This story in Mark’s gospel follows directly after Jesus has delivered the parable of the sower. And Jesus asks us to consider whether we will sow this seed of faith or trust upon fertile ground. The fertile ground that vests in him so that our fears might be transformed. Because he does not want us to remain in our fear and be governed by it. And so he encourages us not to remain in the midst of the storm, but to trust in him to transform that which we find disabling and debilitating. The disciples fears are not evaporated as Jesus calms the wind and the sea. Instead he transforms them from the paralysing anxiety that they create, and which assumes the worst, to a kind of holy awe at the presence and power of the God in their midst. That's the invitation for us as well: to bring our fears, anxieties, and concerns to God as best we can. And to watch as they are transformed so that we become increasingly aware of his presence. So what in the end does Jesus have to say to us as we live out the unpredictable lives which give rise to our fears. Well you have to wonder if the disciples would have got into the boat if they had known that they were going to sail into the storm. Maybe not. But thats what the Sea of Galilee is like apparently. Calm and serene one moment but subject to sudden changes which produce gale force winds the next. There are just some things that you cannot predict. There is always a question as to whether we would have avoided changes in our lives had we known they were afoot. But life isn’t like that. Its not a question of if change will happen, but rather when. We can fear all sorts of things that life might throw at us sometimes - the wind and waves of fear that manifest themselves in our lives as disapproval, rejection, failure, meaningless, illness - all kinds of adversity. Then we might know the image conveyed for us by Mark this morning. The image of Christ with his arms extended wide over the whole of our lives saying, ‘ Peace . Be still’! Almost all of us have some sort of dream of some kind of utopia or paradise where all things are happy and good. It is that fantasy or day dream we have when things are a bit bleak or when we are sitting in the garden or in a comfy chair recovering from a hard day. Is the kingdom of God some kind of utopia or paradise? The Gospel text is about the Kingdom of God. I want us to think about what it means to you and me today. First, what is the kingdom of God? It is not some tangible realm where a ruler has some empire. It is not the new heaven and earth that is to come. It is not a place. It is a way of being. The problem is in a monarchy when someone mentions the word kingdom, we have a vision of some queen or king ruling over their kingdom. But the phrase we translate, KofG, is actually more verbal. It would be better translated as the reign of God or God’s reign. It is the reality of God reigning over our lives and creation; God ruling or governing over all things. It is the taking back of the world and humankind from the influence of selfishness (thinking we can do it all without God) and from the influence of evil forces and impulses (call it the devil, Satan or whatever). St Paul in one of the extremely rare comments about the KofG outside the Gospels states, For the kingdom of God is not food and drink but righteousness and peace and joy in the Holy Spirit. St Paul describes the effect of God reigning in the lives of a Christian as righteousness, peace and joy. But the KofG is more than just an inner spiritual reality. The reign of God affects the earth and all powers and principalities. So Jesus can speak of his mission as preaching good news to the poor, proclaiming freedom for the prisoners and recovery of sight for the blind, releasing the oppressed, proclaiming the year of the Lord's favour. Wherever God’s reign is established things are transformed, turned upside down or right side up, back into their rightful and God designed purpose. Where God is king, things are put right, justice reigns, the needy are cared for, the oppressed are set free. The Kingdom of God is God’s rule in our hearts but also God’s transforming rule in the world, a social and political reality. In sum, when we think of the Kingdom of God we are not thinking of a specific place and concrete realm, but God’s reign over our hearts and lives and over the church and all creation. Secondly, Jesus inaugurated the KofG. You can kind of say that Jesus’ incarnation, coming to be with us in flesh and walking among us, was a reclaiming mission. Jesus’ specific message about the Kingdom of God is recorded as, ‘repent for the KofG has come near’. Another way to say this is: the KofG is in your midst. In Jesus, the reign of God was being established in a new way. It was being inaugurated or instated by Jesus’ message of God’s love and grace and of God’s judgment. It was being initiated by Jesus’ actions, his healing, exorcisms, miracles, meals with sinners, touching the untouchables. In Jesus’ life, message and actions the KofG is began in a new way. In Jesus’ life, message and actions, we see what the reign of God looks like. Thirdly, what do we learn about the KofG from these parables we heard? First we learn that God causes the growth. Our responsibility is not to bring in the KofG. God has done that in Jesus Christ. We are to witness to the KofG, that is to point it out to others in word and deed. We are to live out the KofG in our lives and in the mission and ministry of the Church. We display the reign of God in our lives by the way we live and by our words and deeds. The church by the way it is and by what it does on Sunday and throughout the week, displays the reign of God to others in our community and beyond. One thing we can be asking ourselves is how are we revealing the reign of God or the KofG in our lives and in the life of our church. Habitat for Humanity was founded by a Christian who believed that everyone had the right to a roof over their head. He formed an organisation in which teams of people go to many different countries, mostly in Africa and South America, but even in Europe. Through volunteer labour they build homes and people are able then to buy them at cost with no interest loans. If they help build it as well this counts as payment toward the home. One man put his faith into action and now thousands of families now have a simple basic home which they own and helped build with others. This is the KofG on display. The parable of the mustard seed says we need to recognise that KofG starts small and grows into something large. We don’t always notice the growth but it is happening even while we are sleeping. In one sense, the KofG began with Jesus, one person in Palestine and has slowly grown to be one of the most significant religious and faith movements in the history of humankind. It is still growing even if in some places it is in decline. In parts of Asia it is one of the fastest growing religious movements. It is still growing rapidly in parts of Africa and South America. In another sense, the reign of God on display can begin where we are. It can start small but grow into something amazing. In a parish in Birmingham, there was an old school house. Someone in the parish got the idea that the church could use it as a church hall and maybe to have a place for community groups. The parish was able to obtain it and fix it up. It grew to become one of the largest and most active community centres in Birmingham, Centre 13. A small idea grew into a city-wide and flourishing ministry. This is a sign and symbol of the KofG. The way we participate in the KofG is not by striving to do all the right things, not by struggling to make things happen. Nor is this a passive role, of sitting down and waiting and watching. No, it is an active role of living out our faith with humility, integrity and action. Living out our faith personally and as a church will mean sometimes we need to discern what God wants us to do (MAP). We must pray and tune ourselves into God’s ways and God’s will. We must then act as we believe God is calling us to act. We may at times get it wrong and even fail in our efforts. But God calls us to be faithful. In conclusion, the kingdom of God is God’s reign, God’s rule, God’s lordship being established over each of us and over all of creation. God will bring it to fulfilment just like the little mustard seed grows into a large mustard shrub. As children of God who have been brought into the KofG by faith in Jesus Christ, we bear witness to God’s reign. Our lives and the life of the church is a sign post, a large billboard of God’s reign. We share in and partake of the KofG and its fulfilment by letting our lives be transformed and by bearing fruit that reveals God’s transforming power in our homes, in our communities and in our churches. May God help our life and the life of the church to witness and to display the KofG in word and deed. This story from Mark’s gospel is one of the most unusual and most dramatic stories. It has all the features of TV or movie drama. Jesus’ public ministry has been launched to great success among the people. They are thronging to him in Galilee. The word has gotten out about how Jesus is healing and casting out demons. At the beginning of Mark chapter three, Jesus gets away from the crowds to pray and to appoint the twelve. He is equipping himself for all the hullabaloo that is to follow. He is also organising himself to cope with the crowds by appointing disciples to help. But more significantly, Jesus’ public ministry is the launch, the inauguration of the KofG, which is signalled by the appointment of the 12 disciples representing the twelve tribes of Israel and the twelve who will rule in the new age with the Messiah. Jesus comes down the mountain, like Moses came down from Mt Sinai. We are now in the heart of this drama. Jesus comes down the mountain and he is crushed by the crowd. So much so that they cannot even eat their meal. Jesus’ fame and reputation is spreading and people want more and more of him. Standing back and watching all this is Jesus’ family. They realise that they are loosing Jesus. He is the eldest son and oldest brother. He has a responsibility to the family and the family business. It was kinda of interesting that he took such an interest in spiritual things and in matters of the Law and faith. In fact, he took so much interest in all these matters that people were starting to call him a rabbi. But ever since he was baptised in the Jordon by his cousin, John the Baptist, Jesus has gotten a bit carried away. And since John the Baptist was arrested, Jesus has begun to focus more and more on being with the crowds than being at home. The family does not quite know what to make of his actions, miracles and exorcisms. On the one hand they are amazed, on the other hand they cannot quite believe it is Jesus who is doing this. Each day things seem to be getting more and more incredible. And now, the crowds are overwhelming. People are everywhere demanding Jesus’ attention. The family cannot quite grasp it. They wonder. Has Jesus lost it? Should they begin to bring him back down to reality, bring him back to his reasonable sense? They tell him all this. Jesus faces the fact that his public ministry, his grasp of his commission by God at the river Jordan and during his time in the wilderness is being questioned by his own family. A test of loyalty that he did not expect has come. Should he turn his back on all that is happening, all that God seems to be doing, and go back to Nazareth and be with his family? Watching and observing from the side are also the religious leaders. They have noticed his growing popularity. The have seen the amazing things he is doing. They know their grip on the people is slipping away. So they begin their campaign to discredit Jesus. It is a media spin to turn the crowds against Jesus. The religious leaders pit their reputation and authority against Jesus. They say, this man is not an agent of God, but of Beelzebul. They say that the source of Jesus’ power to do the incredible things come from the devil himself. They portray Jesus as a trickster trying to draw people away from God into the arms of the evil one. It is a clever ploy. They stake their ploy on the fact that many people would look up to them because they were the religious leaders and they were the knowledgeable ones who could discern what God was doing. They seek to totally discredit Jesus. Jesus replies. First he replies to the religious leaders, the scribes. He challenges them how it is possible for Satan to be against himself. Jesus’ actions and exorcisms is showing that evil powers are being defeated, broken, expelled. God is reigning, taking back what is God’s. If Satan was behind this, this represents a house divided which will not stand. 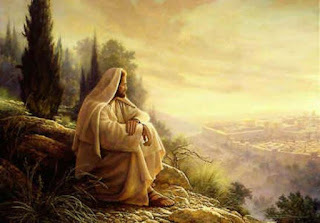 Jesus explains that he has come into the home of the strong man to take it back. The strong man must be bound so that the house can be returned to its rightful owner and inhabitants. Jesus subtly implies that it is actually the religious leaders who are in cahoots with the evil one. If they are opposing what God is doing, they show themselves to be on the side of evil. Jesus makes it very clear that if one actively opposes what God is doing, if one calls the work of the Holy Spirit evil, then one is in danger of being excluded from God’s house, from the KofG. They are stern, harsh words. Jesus shows he is no meek and mild wimp. He stands up to the religious leaders. He answers their accusations with reason and spiritual insight. He presents a choice to the people. They must decide if they will trust the religious leaders or embrace what Jesus is doing as God’s work, as a good and holy movement. We all face those choices. Do we go with God or another way? Sometimes the option to go it alone w/o God is enticing, just as the serpent enticed Adam and Eve to eat the fruit and to go their own way against God’s way. The rewards of pleasing self or of storing up the riches of this world are attractive. But what is truly right and best? To go with God can mean that we go against the tide and flow of the majority. It can be costly to go with God and walk in his ways. We all face the choice. Do we go with God or another way? Jesus faced another choice as well. His family wanted him home. They appear to question his sanity. It was a bit too much for them. Again, to go with God can be a test of loyalty. And people all over the world face this challenge. It is not so much a test we face here in the UK. For some people that choice can actually cost them the love of family. Where is your loyalty? We do not have to reject family to be a child of God. But sometimes family rejects us. Are we willing to take the risk, pay the price of going with God? Jesus’ family would eventually become disciples, and that would only be possible because Jesus chose to go with God and not return home. The gospel reminds us that like Jesus we face choices. We must be careful not to call the things of God wrong or evil. We must be careful in where we place our loyalty. God is at work among us. May God help us all to walk with Christ, to grow in faith, and to do what is right, true, and holy.